Aztec religion was a polytheistic set of beliefs where many gods were worshipped. These different gods had unique powers dealing with different aspects of nature and life and death. 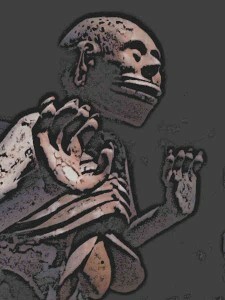 Aztecs has a unique concept of death where the destination of dead people in the afterlife depended on their social status and achievements in this life. Various rituals revolved around death and the Aztec god of death, Mictlantecuhtli, who was considered one of the most powerful and important gods in the Aztec pantheon. The name of the Aztec god of death, Mictlantecuhtli, literally means “Lord of Mictlan”. 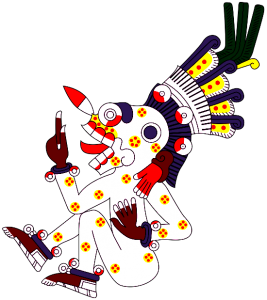 In Aztec religion and mythology, Mictlan was the lowest and northernmost section of the underworld and was ruled by Mictlantecuhtli along with his wife, Mictecacíhuatl. Although there were also several other gods and goddesses of death in the underworld, Mictlantecuhtli was the most powerful and most prominent among them all and thus religious ceremonies and rituals were reserved for him. Mictlantecuhtli is depicted on a variety of Aztec codices from different times. 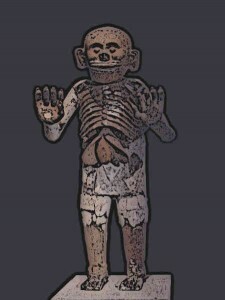 In these codices, Mictlantecuhtli is often depicted with his skeletal jaw open in which the stars, according to Aztec belief, descended during the daytime. In the famous Codex Rios, a Spanish colonial-era manuscript, Mictlantecuhtli is called the “lord of the underworld”. Similarly, he is depicted as the symbol of a dog in the Codix Borgia. The appearance of the Aztec god of death, Mictlantecuhtli, is evident from various works of art of the Aztecs in addition to Aztec codices. For instance, there were two life-size statues of Mictlantecuhtli at the entrance to the House of Eagles at the Great Temple of Tenochtitlan. Perhaps the most famous representation is the fired-clay statue of Mictlantecuhtli which was discovered in 1994 from the sacred precinct of Tenochtitlan. It is a six feet high statue and represents a form with its skin ripped off and liver hanging out. While Aztec god of death Mictlantecuhtli was the king of the underworld, there was also a queen of the underworld in Aztec religion. Her name was Mictecacihuatl and she ruled over the underworld along with Aztec god of death Mictlantecuhtli who was also her husband. According of Aztec beliefs, she watched over the bones of the dead and presided over the ancient festivals of the dead. In various Aztec drawings and the Aztec calendar, Mictlantecuhtli is represented as the god of the day sign Itzcuintli which means “dog”. This was among the 20 different signs recognised in the Aztec calendar. On the Aztec calendar, the Aztec god of death Mictlantecuhtli was represented as the source of souls for people born on the sixth day of the 13-day week. He was also the fifth of the nine night gods of the Aztecs. Further, Mictlantecuhtli was the secondary week god for the tenth week of the 20-week cycle of the Aztec calendar. On the calendar, he joined the sun god Tonatiuh to symbolise the contrast between light and darkness. There was a rich set of beliefs related to Aztec god of death Mictlantecuhtli in Aztec religion. According to these beliefs, people who died in certain ways went to different kinds of paradises and the rest of the people who died ordinary deaths went to the underworld governed by Mictlantecuhtli. After death, their souls had to make a four year journey, going through various trials including the nine hells of Mictlan. Finally, they found their final resting place with Mictlantecuhtli. Rich representations of Aztec god of death Mictlantecuhtli existed in Aztec art. In most of the works of art, he is represented as a skeleton or covered in bones with red spots representing blood. In some representations, he is wearing a skull mask along with bone ear plugs and a costume of owl feathers. Other features of the representation of Aztec god of death in art include curly black hair and powerful eyes that help in penetrating the gloomy underworld. In yet other artistic representations of Aztec god of death Mictlantecuhtli, he can be found wearing cloths and donning a canonical hat made of bark-paper. Other than various other Aztecs gods, human sacrifice was offered as a ritual practice to the Aztec god of death, Mictlantecuhtli. According to some scholars, the holes in the head of the 6-feet fired-clay statue of Aztec god of death Mictlantecuhtli contained the hair of the people who were sacrificed in his honor. He was worshiped during the Aztec month Tititl at the temple of Tlalxicco and other than human sacrifice, incense was burned in his honour. This human sacrifice was performed during the religious ceremonies and the victims were sometimes drugged in order to reduce the resistance. Usually four priests performed the sacrificial ritual which consisted of cutting out the heart of the victim and using the rest of the body for cannibalism. While the Aztecs had a unique concept of death and afterlife, they generally buried their dead people underground like most other civilisations. In certain cases, dead people were also cremated and evidence has been found about Aztec emperors being cremated upon their death. Dead people were offered to the earth as a tribute. A variety of religious hymns and prayers were reserved for the funeral ceremony of the people, particularly those from the upper classes of society. Unless the dead people were warriors who died on the battleground, sacrificed people, or women dying in childbirth, they all went to the underworld ruled by the Aztec death god Mictlantecuhtli. Aztecs had a unique concept of death where the destination of the dead people in the afterlife was decided according to the nature of their death and their social status. The Aztec god of death was called Mictlantecuhtli and he, along with his wife Mictecacihuatl, ruled the underworld. Most of the people dying ordinary deaths were thought to undergo a four ‘year long journey at the end of which they found their final abode with Mictlantecuhtli. Worship of Mictlantecuhtli was a regular feature of Aztec religion and also included human sacrifice.